Situated in Palm Views West on Palm Jumeirah, this trendy seafront restaurant is a popular place to grab posh fish and chips and other British favourites such as Shepard’s pie and Cornish cheese and onion pasties. 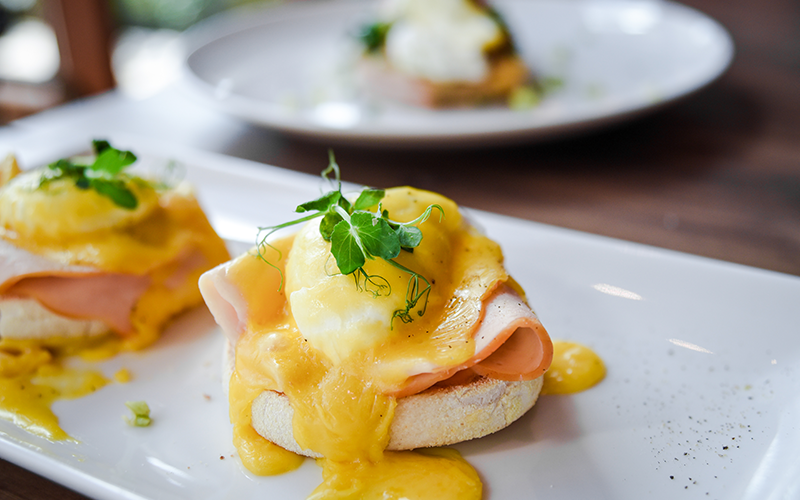 Recently, the restaurant launched a brand-new breakfast menu, running every weekend from 10am. As is to be expected – there are plenty of British dishes on the menu. There’s a full English (served the traditional way, but with veal bacon), eggs Benedict and smoked salmon and eggs. There’s plenty for health food fans (the avocado on toast is delicious, as is the Instagramable date, banana, honey and almond milk smoothie). There’s lots available for those with a sweet tooth too. There’s yummy French toast, pancakes and a selection of pastries available. Dishes are reasonably priced – ranging from AED 25- 65. The waiting staff were fantastic. The kitchen is led by head chef Anthony Reilly, who often comes in the restaurant to have a chat with guests about the different dishes on the menu. The team knew the new menu well, and service was speedy. The restaurant was about half full when BBC Good Food Middle East visited. Our advice: as the weather cools down, head down early and get one of the best spots on the terrace. There’s great views of the Palm marina, and surrounding fronds. Details: Breakfast for two people is around AED 150 including coffee. For more information on booking a table or to look at the menu, visit Senara.